Oh my oh my I wish I was eating this right now. Yes I realize it's 8:00 a.m. but I could easily eat this for breakfast. I have had zucchini noodles before when a friend made them for me, but there really isn't a good way to make them unless you have some kind spiralizer. I bought a veggetti the other weekend and was eagerly planning what my first zoodle dish would be. I made this carbonara Monday night and I think I won dinner. It made a huge bowl of luxurious sinful carbonara, but with the sub of zucchini noodles instead of pasta, the whole skillet came out under 350 calories. Like I said, I ate the whole skillet myself. I thought it was ambitious at first but I was scraping my plate wanting more. This could easily serve two, just pair with some steamed veggies or a side salad. If you are wanting to make for more people, just note that you should buy about 1 1/2 zucchini per person. Using a spiralizer or veggetti, create your zucchini noodles and place in a bowl to set aside. In a skillet or sauté pan, over medium heat, cook your pancetta until brown and crispy. Add the minced garlic to the pancetta and cook for about 2 minutes being carful not to burn the garlic. 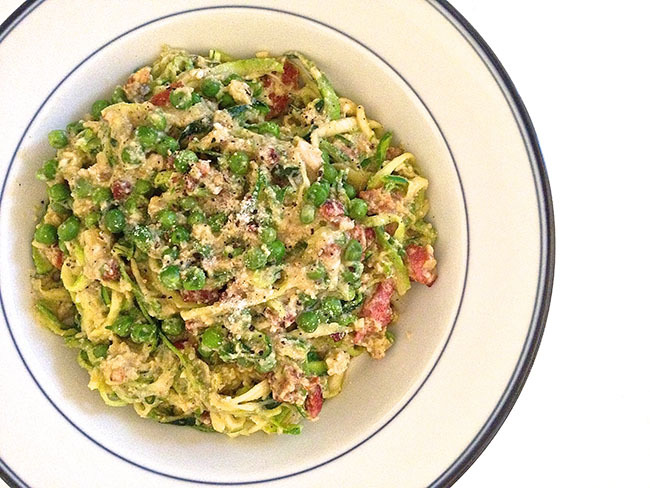 Add your zucchini noodles and peas straight to the skillet. Don't clean your pan, the pancetta renderings give it great flavor. In a small bowl, beat your egg and parmesan cheese. Pour the cheesy egg sauce into the pan and combine to coat the noodles. The zucchini should have enough moisture to mix with the sauce but if it's too thick thin it out with a little water or milk. Salt and pepper to taste and it's done!